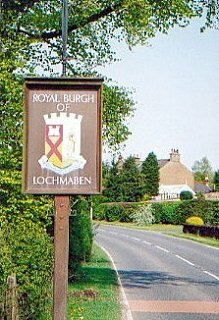 A small royal burgh founded in 1296, Lochmaben in Dumfries and Galloway is situated in the valley of the Annan 9 miles (14.5 km) northeast of Dumfries between Castle Loch, Kirk Loch and Mill Loch. Its first superiors were the Bruces, lords of Annandale, followed by the Earls of Moray and the Earl of Douglas, becoming a royal burgh in 1440. It had a small, local textile industry (woollens) while today it is noted for its dairy products. Notable buildings include a parish church (1818), town hall (early 18th and late 19th centuries), and the Edward VII Memorial Fountain (1910-11). Lochmaben once had a station on the Dumfries, Lochmaben and Lockerbie Railway, which opened in 1863, closed to passengers in 1952 and closed completely in 1966. Lochmaben Hospital was opened in 1905 as the infectious diseases hospital for the county of Dumfries. There is an 18 hole golf course and a sailing club. Nearby stands the site of Lochmaben Old Castle (mid 12th Century) and Lochmaben Castle (begun c.1300, 1 mile (1.5 km) southeast), Elshieshields Tower (16th century) and the mansion house of Halleaths (1866, by David Bryce).